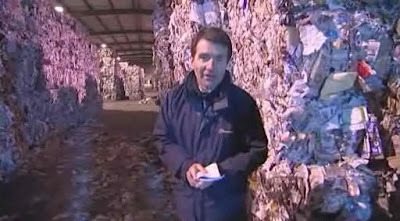 BBC environment correspondent David Shukman has a book out in April: “Reporting Live From the End of the World“. A suitably alarmist double meaning in the title there, but I guess it’s more catchy than “Reporting Live From a Temporarily Low Reservoir (Rain Sure To Follow)”. At least he knows exactly what will happen to all the unsold copies of his book. Just saw ugly female beeboid interview Caroline Spelman on News 24. Spelman was useless but the female beeboids defence of McMong’s Government over this mess with the roads was a joke. Can people remember how Boris Johnson got HAMMERED by the drug addicts at the BBC last year when London had a load of snow? The Government were warned ages ago about the lack of grit and salt for the roads. The stuff costs pennies (£20 a ton) so why not stock loads of it. Now many people also suspect that since McMong has taken over the control of grit and salt that much of it is being diverted to Labour heartlands in the north. The problem here is that Brown wants to manage everything. He should have nothing to do with gritting roads, this is the responsability of the local council. If they mismanage it then they are acountable to local population. The trouble with this Labour lot is that the micro-manage everything and that is how it goes wrong. Not in this Labour heartland, it has been taking me four hours to get 20 files to work every day as most villages in County Durham are blocked by snow. If it wasn’t for the likes of the BBC constantly peddling the global warming scam and the Met Office could forcast weather without political interference from Labour, then councils just may have stockpiled more grit. JHT — what’s the background on the “McMong” nick-name? Cheers. I just did a quick webernet look! I get what the “mong” refers too, now. Obvious when you think about it! Her science qualifications have been ably outlined above. Though such things can reassure that what is being reported upon will possibly be with more informed ‘watertight oversight’ (the reason given for shutting down Richard Black’s blog during an inconvenient period), there is no guarantee. And she is very comfortable with the notion of enhancing narratives and interpreting events in the edit suite, as the episode, also via Newsnight, of being the warm up act in ‘helping’ President Obama’s inaugural speech along revealed. In fact Newsnight does have pretty consistent form, and is still playing down getting a rocket scientist, a Sir and a ‘we’re now convinced’ shopping channel audience to the same place Ed Miliband held his pre-Copenhagen ‘kitchen cabinet’ (of two folk, plus host) to settle some science Brainiac style (except in Brainiac the science is often factually accurate). There is much to discuss, and weigh. The BBC are not doing it very well, or honestly. And trust, once lost, is even harder to regain.